Everyone wants to be an entrepreneur, but it is hard to understand the impact that this will have on your friends and family. When you take the next step of becoming a business owner, you can lose friends and your family relationships could weaken — without balance. This is because some entrepreneurs are so consumed with the role of creating a business that their business begins to consume their life. Have you ever felt like when you are not at work all you can think about is what you need to perform in your business? Have you begun to outgrow people as they do not understand your busy lifestyle? Do you feel like you do not have time for small talk or to get caught up with friends? A startup can consume your life — if you allow it to. You need to leave time for your own personal growth and spiritual growth. You can do this by prioritizing your time. You should create time in your schedule to spend in your faith and with your family. You can balance your family, friends, faith, and your business, and when you do, you will find that everything feels like it is happening with ease. You will begin to see how the benefits of one area reflect in other parts of your life. Zig Ziglar used a tool when he explained this concept called the Wheel of Life. In his presentations, he would hold up a wheel with 7 spokes. Each spoke represented different areas of life one has to balance: Mental, Spiritual, Physical, Family, Financial, Personal, and Career. When one is out of balance, it affects the other 6. When you are spending time with your family, turn off your phone and laptop. Even though this can be extremely hard to do, it is important that you continue to build stronger relationships within your family and balance work vs. home in a way that is appropriate. For your mental “spoke”, take for example your friendships. You are in complete control of who engages with you. If you do not want to talk with someone, then you should not respond. If your friends are not encouraging you or celebrating your wins with you, you should eliminate them from your life. It is very easy to get run down within a business, therefore, you need to keep those around you positive and protect your energy as much as possible. Even though it can feel challenging to make time for family and friends, it is crucial for your own growth and success! 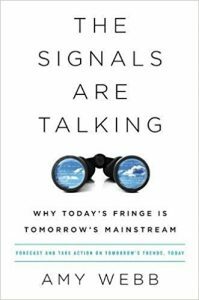 Had I not heard Amy Webb on an episode of This Week in Tech, I would never have picked up her book, The Signals Are Talking: Why Today’s Fringe Is Tomorrow’s Mainstream (2016, PublicAffairs). Had the first chapter not hooked me, I probably would have taken it back to the library and devoured one of the many novels on my pile. What Webb proposes throughout the book is…well, it’s fun. Especially if you’re a techie. Even if you’re not a techie. The future doesn’t simply arrive fully formed overnight, but emerges step by step. It first appears at seemingly random points around the fringes of society, never in the mainstream. Without context, these points can appear disparate, unrelated, and hard to connect meaningfully. But over time they fit into patterns and come into focus as a full-blown trend: a convergence of multiple points that reveal a direction or tendency, a force that combines some human need and new enabling technology that will shape the future. She goes on to describe an experience she had in Japan in 1997, where she was first introduced to mobile web browsing…long before it became something so ordinary that we barely talk about it (unless you’re in marketing, and then you obsess over mobile). Signals is a book that, Webb explains, “contains a method for seeing the future. It’s an organized approach that, if followed, will advance your understanding of the world as it is changing.” She spends the next 10 chapters and 250-plus pages teaching you the forecasting techniques she uses in her career as a futurist. I couldn’t help but think that many of us — perhaps, in fact, all of us — should be reading books like this. Webb’s approach is one of strategic thinking, a kind of thinking that the entrepreneurs and business leaders I’ve been working with for over two decades have long embraced. She’s outlined the exact steps she uses, and peppers the book with examples from both a looking-backward and a looking-forward approach. I couldn’t help but smile as she outlined the cases for flying cars, or rather, the cases for not having flying cars. It became a shorthand conversation throughout the book, and I can’t say I minded it. Do flying cars matter? No, not really. But how often are we blinded by the glitter of something like flying cars and lose sight of the very boring, very real, very obvious changes in the world? Webb is challenging readers to see the future not as a big scary place, but as the next moment from now. The future, as it turns out, is something that’s not so shocking. It makes me think, in fact, of a current commercial from CarMax. “I know this because I’m from seven days in the future,” the man on the screen says. At the end, after his monologue, he admits, “It’s pretty much the same,” referring to the differences between seven days and now. But changes happen in small increments, gathering steam until it seems they suddenly take over: had you heard the “signals” that Webb teaches you to pay attention to, you would not have been so shocked (though you may be just as delighted). How can we apply this to our lives? I can think of about 1000 ways, and rather than outline them, I would rather recommend this book and challenge you to read it for yourself. You might even want to highlight it, dog ear it, and come back to it later. And that leads to the next business read that seems to reach far beyond my business background and into every nook and cranny of my life, from faith to parenthood and all the things in between. 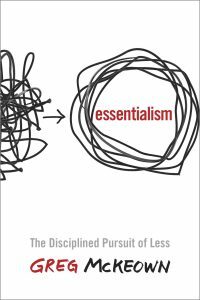 Essentialism: The Disciplined Pursuit of Less, by Greg McKeown (Crown, 2014), was mentioned in a by-the-way manner on a call with my mastermind group. I really respected that person’s mention, took it as a recommendation, and ordered the book. It then sat on a bookshelf gathering dust until we turned our house upside down rearranging and reworking our living space. As I put it back on a different shelf in a different room, considering whether I would keep it or give it away, I remembered how Lisa had said, ever so casually, that it was a really helpful read. I’m in a strange juncture right now, and “really helpful” triggered my desire to read it. So I picked it up on a Sunday, instead of firing up my laptop to try to squeeze in more work. Four days later, I was finished with it, but not before sharing images of it all over my social media channels and feeling my brain exploding. The last time I had this experience with a business book, I was reading Stephen Covey’s The 7 Habits of Highly Effective People. The way of the Essentialist is the path to being in control of our own choices. It is a path to new levels of success and meaning. Despite all these benefits, however, there are too many forces conspiring to keep us from applying the disciplined pursuit of less but better, which may be why so many end up on the misdirected path of the Nonessentialist. I need that reminder. And don’t we all, especially as we carry around an electronic tether and find ourselves treating Saturday as the new Friday? So often, we approach our lives as though they are a tunnel, and as though there is only one straight way through. Even when we’re at a juncture, we consider that there’s an A or B choice, not that we could choose both (or neither). Sometimes, we just need something to shake us up, turn us upside down, remind us of what’s truly important. There are many ways this can happen, and surely a book isn’t just the only way. I’ve had more than one of these experiences in the last decade, and I’m sure you have too. But what do you do with them? How do you actually change your life and your way of executing? That’s one of the things I really appreciated about Essentialism. McKeown isn’t speaking in theoreticals, he’s speaking in practicalities. And he’s not wasting words doing it. I’ll be rereading this, that’s for sure. And I’ll be doing more than just thinking about how to apply the concepts: I’ll be doing.